01-31-2019 – Over-the-air (OTA) TV—the programming that we all have access to even if we don’t have a cable or satellite programming subscription—is becoming a big thing again. In fact, it’s one of the best things to happen to cord cutters and cord shavers, as it offers them free TV through a digital antenna. Even better, with the shift to digital broadcasting a decade ago, they’re getting even more channels for free—and in great HD quality. Because of our comprehensive panel approach, our data is inclusive of all household types, including OTA, which allowed us to conduct deep insights and analysis in this important growing segment. So what do we know about OTA households? We recently dived into the data to find out more about them—particularly, how many there are, what they look like and how they consume media. According to May 2018 Nielsen population estimates, as detailed in our latest Local Watch report, there are over 16 million OTA homes in the U.S. That comes out to just over 14% of households. Back in 2010, that number was much lower—5 million less, to be exact. That’s an increase of almost 50% over eight years. And as an increasing number of consumers consider a more à-la-carte approach to their TV sources, there is opportunity for this segment to continue growing. While many of us may equate OTA TV with “rabbit ears” and a physical dial on the TV set, today’s, OTA homes aren’t what they used to be—just like the technology isn’t the same. Today, these homes are a mix of audience groups that consume TV content in different ways. Some are standard OTA homes that access programming with a digital antenna, but most pair their OTA line-up with streaming services. As of May 2018, 41% of OTA homes are traditional, without a streaming service provider. That means the majority subscribe to a streaming service (59%). Nielsen data paints a vivid picture of these two very different groups, revealing some surprising gaps in age, ethnicity and income. Suffice to say, the only thing these households have in common is the absence of cable cords and satellite dishes. To further muddy the waters, a third type of OTA home subscribes to a virtual video multichannel programming distributor (vMVPD), commonly known as a “skinny bundle,” which allows them to stream cable programs. This group falls directly into the streaming service segment (Plus SVOD) that makes up 59% of OTA homes. As of May 2018, it accounted for 8% of OTA, or 1.3 million homes. Three hours each day comes out to roughly 1,100 hours per year, which represents the amount of time the average adult in an OTA home spends watching broadcast content on TV. While that’s a big number, it can be deceiving. Behind the scenes, three very different audience segments (no SVOD; OTA + SVOD; OTA + SVOD w/vMVPD) make up that number. So which segment is watching the most content? Those without SVOD spend a whopping 4 hours and 51 minutes with broadcast TV each day. But, the story is different for the others. Higher fragmentation driven by internet-connected device usage brings broadcast viewing down, but SVOD homes with and without a vMVPD still clock over an hour per day. Cable viewing picks up steam with vMVPD access, but still lags behind broadcast viewing. Regardless of OTA home type, broadcast TV is a daily go-to source for content on the TV screen. 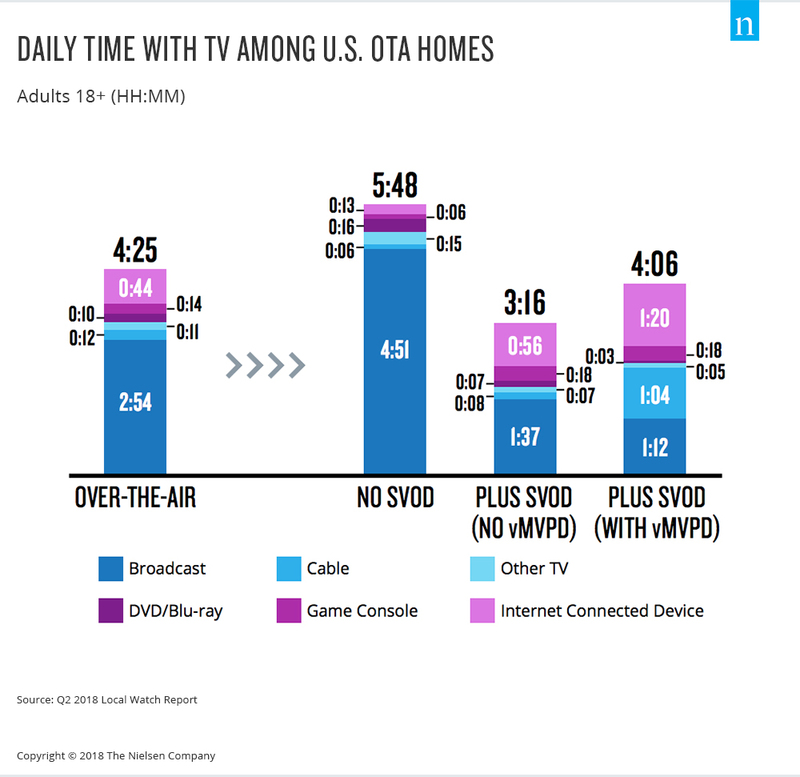 03-11-2019 – Despite the prevalence of digital technologies rippling through many aspects of our daily lives, an increasing percentage of Americans are embracing over-the-air (OTA) television. And in looking at findings from Nielsen’s most recent Local Watch Report, we see an upward trend in the adoption of digital OTA tuners. 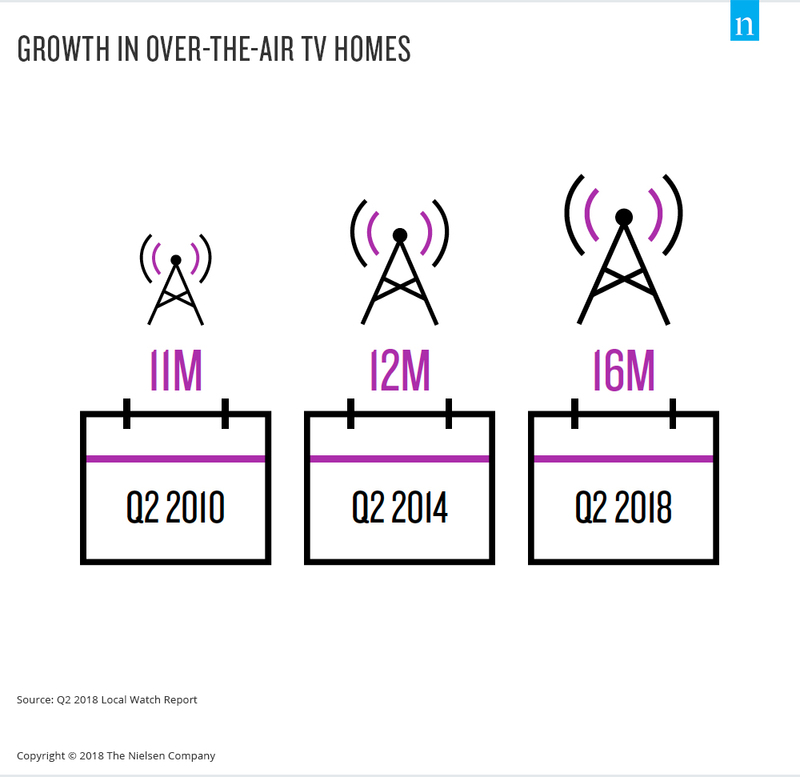 But while the 16 million OTA homes (as of May 2018) paints an overarching national picture, our comprehensive panel approach to TV measurement allows us to dive into the data to understand the different types of OTA viewers across the U.S. and where they’re most likely to live. While the majority of U.S. homes still subscribe to a pay-TV service (cable or satellite), the shift to free broadcast TV suggests that folks are exploring alternatives. And with a myriad of internet options available today, many of them aren’t mutually exclusive with their viewing options. Rather, they’re pairing their broadcast local news and network stations with a subscription video-on-demand (SVOD) streaming service. 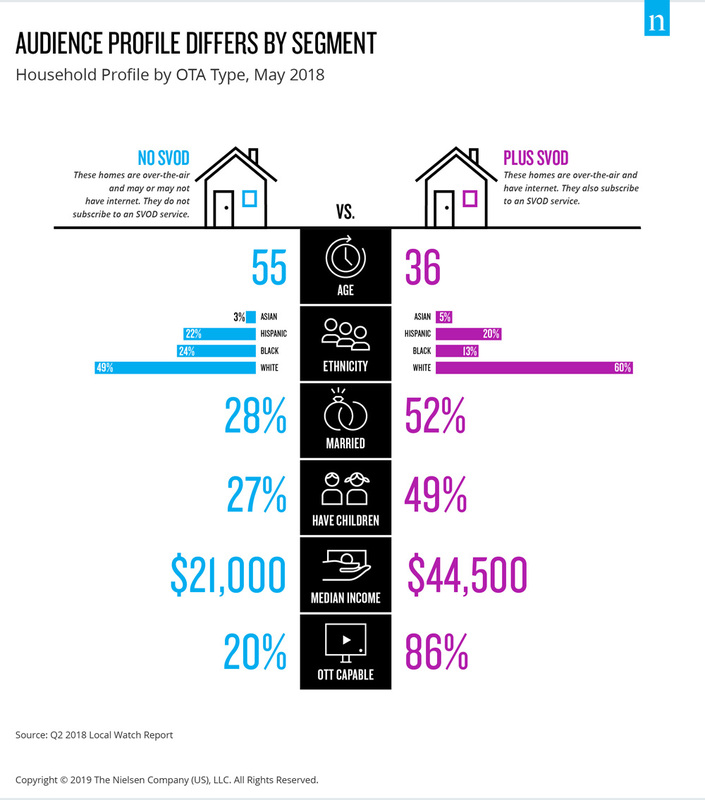 According to Nielsen’s TV panel, 59% of OTA homes have access to SVOD and 41% don’t. And things get even more interesting when we factor in a third underlying segment: OTA homes that subscribe to a virtual multichannel video programming distributor (vMVPD). These services provide a broad range of video content through an internet connection (rather than through wired cable or satellite). Consumers who supplement their OTA viewing with “skinny bundles” from vMVPD services can stream programs to their smart TVs and mobile devices. Small but growing, these consumers make up 8% of OTA homes, which comes out to about 1.3 million U.S. households. While these numbers tell the big-picture story, we can take things further by drilling down to local markets, which reveal some surprising differences in OTA status. In looking at Nielsen data, we see a high concentration of OTA homes in the Southwest region, averaging 19% of households in those areas. This makes sense, since this area is popular among Hispanics—a group, according to our profile data—that is 48% more likely to have OTA status than the average U.S home. Meanwhile, on the other side of the country, Northeasterners are more likely to stick to their cable packages, with only 7% of households having OTA access. This region also experienced the smallest year-over-year growth. Designated market-level (DMA) stats from the Local Watch Report support these findings, with markets like Albuquerque and Phoenix topping the list for presence of OTA homes. Meanwhile, markets like New York and Boston rank among the lowest for OTA penetration. Milwaukee is an interesting outlier, as it has the highest penetration for both OTA homes with and without SVOD. Dayton came out on top for the market most likely to pair OTA with vMVPD. They’ve tried to play nice. They’ve tried to play hardball. But nothing the cable companies do is stopping the affliction terrorizing the TV industry. MANHATTAN BEACH, Calif. – We’d tried other over-the-air antennas before, and the results were dismal. A fuzzy picture, at best. Ten years ago, the antenna to receive over-the-air TV was a dying trend. Increasingly, Americans ditched antennas in favor of cable TV. Now that trend has reversed with the growth of cord cutting. Over-the-Air (OTA) TV signals are distributed across two different frequency bands: UHF (Ultra High Frequency) and VHF (Very High Frequency). Like many other families, we bought “cable-ready” televisions because we wanted to take them home and hook them directly to the cable. Everything a cord cutter needs to know about free over-the-air 4K HDR broadcasts. It’s been two years since we last wrote about ATSC 3.0, also known as “Next Gen TV,” and a lot has changed. But with the breakneck speed of change in other areas of TV — namely streaming video — the new version of free antenna TV is moving at a snail’s pace. Installing an outdoor antenna is an easy way to stretch your entertainment dollars. Most homeowners can legally install an outdoor antenna, as long as it does not reach more than 12 feet above the roof line, does not create any safety risks and does not impede upon existing neighborhood covenants. Step 1: Use an internet search to locate TV broadcast towers near the home. The Over the Air Digital TV website otadtv.com has a wealth of information as well as detailed maps and coordinates for tower locations. For those who want to dabble in geometry, mathematics and geography, technical data for optimal antenna location is available. Otherwise, pointing an antenna in the direction of the closest TV tower will usually suffice. Step 2: Antennas can be mounted on the side of a home, on the roof or on a free-standing antenna tower. Antennas can also be installed in a home’s attic. Attic installations will reduce the signal strength and possibly limit the number of channels that can be received, but the ease of installation and the aesthetics of not having an antenna mounted on the outside of a home may outweigh the negative signal impact. Step 3: Choose an antenna and mounting hardware that best suits the needs and budget of the homeowner. Follow the manufacturer’s instructions and assemble the antenna and accessories. Step 4: Use the existing television cable connections or run new RG-6 four-wire coaxial cable to the rooms where televisions will be used. Step 5: Install a coax ground block where the cable enters the home. Run a 10 gauge or heavier grounding wire from the coax ground block to a grounding rod or earth grounded pipe. Step 6: Determine the ideal location for the antenna based on the proximity of broadcast towers. Antennas work best when mounted thirty feet above the ground in an unobstructed space away from metal, wire and other signal blocking materials. Step 7: Before mounting the antenna, attach the antenna cable to a working television and with the help of a friend, use the picture quality and channel reception to determine the optimal antenna mounting position. Step 8: Mount the antenna in accordance with the manufacturer’s instructions. Coat any screw holes with an elastomeric sealant. Step 9: Run a grounding wire from the antenna to an earth grounded rod. Step 10: Attach the antenna wire to the television cable and enjoy. That’s up from 16% in early 2015, according to Parks Associates. That’s up from about 16% in early 2015, Parks Associates said, noting that the growth rate coincides with a steady decline of pay TV subscriptions against the backdrop of an increase in OTT video subscriptions. There’s a caveat on these numbers: eMarketer’s estimates for pay-TV viewers do not include “virtual” internet TV services, such as Dish Network’s Sling TV, AT&T’s DirecTV Now, Hulu’s live TV service, or YouTube TV. But industry analysts say over-the-top TV subscription services so far have not offset declines in traditional pay television. Moreover, the cheaper OTT packages typically include fewer channels, so the growth of “skinny” TV bundles implies net household losses for many cable networks. Seeing the writing on this wall, several TV programmers have launched or are prepping direct-to-consumer streaming services themselves. CBS in 2014 launched All Access, while Disney has set early 2018 for the debut of a no-cable-needed ESPN OTT package (although that will exclude NFL and NBA games). In addition, five media companies — A+E Networks, Viacom, Discovery, Scripps Networks Interactive and AMC Networks — reportedly have joined forces to create a non-sports streaming bundle of cable programming to be priced at under $20 per month. For the TV biz, there’s another worrisome trend: People are watching less traditional television. For the first time, in 2017 average TV viewing in the U.S. is expected to drop below 4 hours per day, eMarketer predicts. Average time spent watching TV (excluding digital) among American adults will drop 3.1%, to 3 hours 58 minutes this year. Digital-video consumption, meanwhile, continues to climb. U.S. adults will consume 1 hour 17 minutes of digital video per day on average in 2017 (excluding time spent viewing video on social networks), up 9.3% year over year, according to eMarketer. With the U.S. pay-TV base eroding faster than anticipated and average TV viewing time dropping, eMarketer cut its TV ad-spending forecast for 2017 by a little over $1 billion. This year, TV advertising will increase just 0.5%, to $71.65 billion (versus the firm’s previous $72.72 billion forecast). As a result, the TV sector’s share of total U.S. media ad spending will drop to 34.9% (vs. 36.6% in 2016) and is expected to fall below 30% by 2021. Correction: A previous version of this article incorrectly stated that 22.2 million U.S. adults were expected to cancel pay-TV service in 2017; in fact, eMarketer’s estimate represents the cumulative number of cord-cutters projected by the end of the year. Have you cut the cord yet? Are you familiar with that expression? You’ve probably been hearing that term a lot lately, including on Komando.com. It refers to people cutting the cord on cable TV or satellite TV. Were you aware that you can get some local major network channels for free, without having to pay for a cable or streaming service subscription? If you were, you’re ahead of 30% of adults, most of them young enough that they wouldn’t remember the fuzzy, rabbit-eared past.